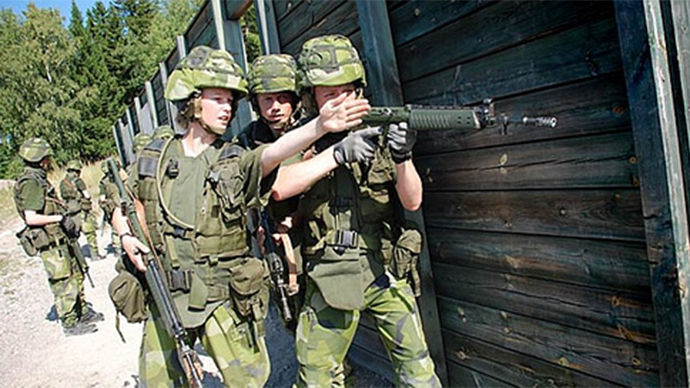 The Swedish Army is set to appoint advisers by 2016 to determine gender policies in the military. The move has puzzled many on social media, with some asking whether it’s a joke. The step is partly due to the growing numbers of women in the armed forces, the Local reports. So-called 'Gender Focal Points' are to be set up in each unit to determine gender policies. A course to train gender advisers has just been implemented at the Nordic Centre for Gender in Military Operations. “The course has by and large consisted of workshops and seminars. The goal is that we will have a GFP stationed at every unit, by 2016 at the latest, who will use 10-20 percent of their work hours to focus on gender issues,” course leader Major Ola Nilsson said in a statement, as quoted by the Local. The military personnel also pointed out that the idea hasn’t just come out of the blue. “We've been working with this for 10 years. It's nothing new, but what we want to do now is try to find concrete ways of working with gender issues,” Captain Anna Björsson, who is responsible for gender issues at the task force command, said. She believes diversity in the army ranks is important. “Even today, only 10 percent of our staff are women. It's not a question of asking what women as such can bring to the organization – I think you have to be wary of that – but it is very important to have a gender mix, but also a mix of ages, backgrounds and ethnicities,” Björsson said, according to the Local. The Swedish Army’s move has triggered fierce debate on social media, with some Twitter users asking if the step is a joke. Björsson replied to threats that the Swedish Army has to live up to the “gender ideals” they promote, and they should act “as a role model”. “We have a direct order from the government to integrate equality into our work. And as the organization whose job it is to defend our nation in the event of an attack, women's rights concern us very much,” she responded.